​CALIBER: 7.62mm rated to .300 RUM; Belt Fed Rated™ DIAMETER: 1.5” LENGTH: 9” to 7.5″ WEIGHT: 21.5 oz to 17.5 oz SOUND LEVEL: (SPL) 134-138.4 Db FINISH: Cerakote MATERIALS: Baffles: Stellite™ core. Tube & Mount: 17-4 PH Stainless Steel.FEATURES ADAPT™ Modular Technology. Interchangeable Front Caps 7.62mm (5.56mm available). Monolithic 17-4 PH Stainless Steel Mount. Quick Detach Dual Taper Locking System™. Unconditional Lifetime Warranty. 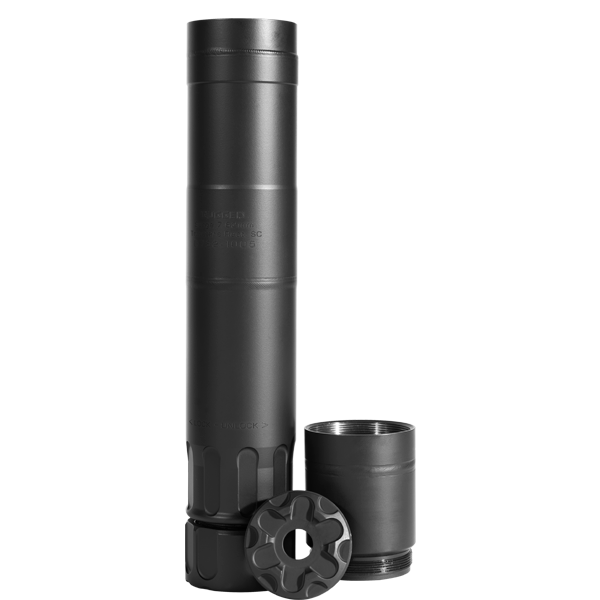 INCLUDES: 7.62 R3 Flash Hider (5/8×24 Thread Pitch). 7.62 Front Cap. Surge 762 Suppressor. ADAPT Module. Operator’s Manual. Dual Taper Lock™ Mounting Instructions. Rugged Suppressors Sticker. R Logo Sticker.